A lathe or mill power feed using an electric drill by Joe Katona - Millhill Supplies Ltd.
t the 2011 NAMES show in Detroit, Sherline dealer Joe Katona of JK Woodcraft came by the booth to show us a device he came up with to allow the use of a battery powered drill or electric screwdriver to turn the handwheel to move the long axis of the lathe when moving over long travels. At 20 revolutions per inch it can take a long time to manually move it through the 17″ center to center distance on the longbed lathe. This adapter fits in a drill chuck and can either be left on the drill or left on the handwheel. It will work on the mill adjustable zero handwheels as well. 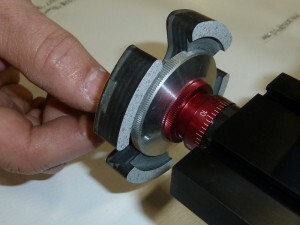 The adapter is shown pressed into position on a 4400 lathe crosslide handwheel. It really comes in handy on the longer axis but will work on any Sherline lathe or mill adjustable zero handwheel. Joe made the part on a Sherline CNC mill from ½” thick laminated phenolic plastic, a machineable thermoset material that will not mar the aluminum handwheels. This version was a press fit, but the cutouts allow you to use a rubber band to help hold it on if you prefer to leave it in place. 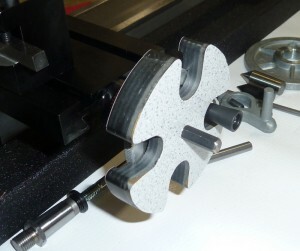 Joe machined two “steps” inside to allow it to be used on 2″ or 2.5″ adjustable zero handwheels on his 4400 lathe. 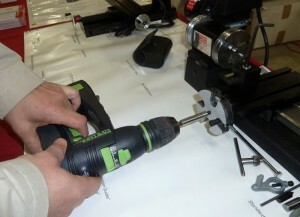 The cutout for the handwheel allows it to be used manually even with the adapter in place. (A smaller version would be needed for use on plain 1-5/8″ handwheels.) The hardened hex stock was cut from an old hex wrench using an inserted tip ceramic cutter and simply pressed into a round hole. The ends were beveled slightly to remove sharp corners. Here you can see the two steps in the back side. The part was cut using a 1-1/4″ milling cutter, and 0,0 was the center of the part. He started with a 4″ square piece of stock. A reversible, battery powered electric drill makes quick work of long travels in either direction. An electric screwdriver would work too.